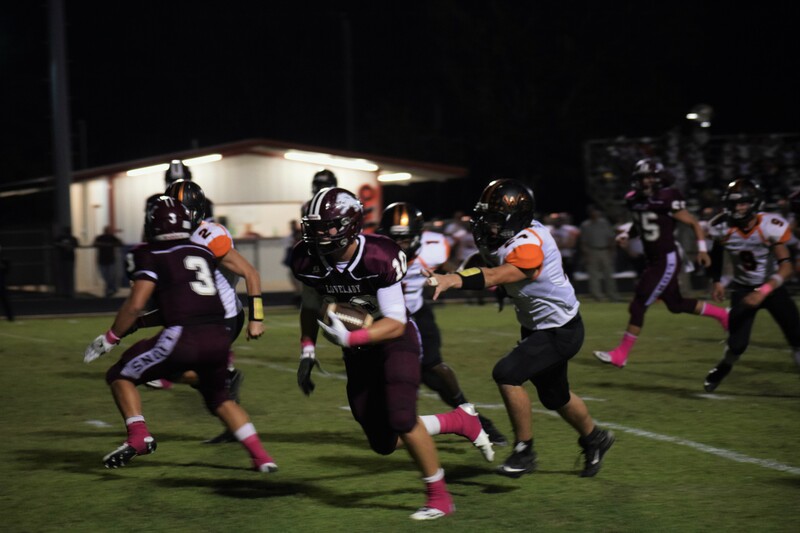 LOVELADY – Through the first quarter and midway into the second, the Lovelady Lions looked like anything but a top five team in Class 2A DI. Early on, it even appeared as if the West Sabine Tigers might just spoil the Lions’ Homecoming. 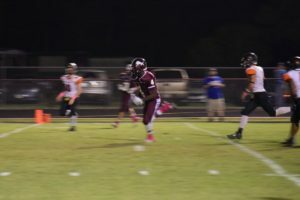 A 21 point scoring outburst in the third quarter, however, erased any doubts the Lovelady faithful might have as the Lions used the momentum that created to coast to a 52-20 victory. The win moved Lovelady’s record to 5-0 on the season and 1-0 in district 12-2A DI. The Lions won the opening coin toss and deferred to the second half. An onside kick attemp t backfired on Lovelady to start the game and gave the Tigers possession of the ball at their own 44 yard line. West Sabine kept the ball on the ground and managed to pick up big chunks of yardage thanks to QB Demarie Smith, along with running backs Dylon Fruge and Zack Franklin. The Tigers moved into the red zone but faced a fourth and one at the Lions’ 15. Fruge managed to pick up the first down and Franklin powered the ball down to the 12 on the next play. 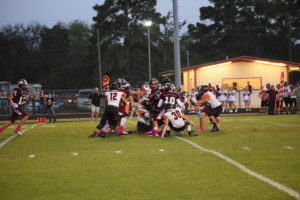 A holding penalty on second down pushed the ball back to the Lovelady 22, but on the next play, Smith connected with Dailon Smith on a 22 yard scoring strike. The try for two was no good but with 7:57 remaining in the quarter, the Tigers led 6-0. Following the kickoff, Lovelady took possession at their own 39. On their first play from scrimmage, however, a bad exchange between Lions’ QB Lee Holsey and running back Tim Johnson resulted in a fumble recovery by the Tigers. The Tigers tried to capitalize on the turnover immediately. Smith connected with Jesse Biscamp for a 14 yard pickup while a facemask penalty against Lovelady tacked on even more yardage and moved the ball inside the 12. Fortunately for the Homecoming crowd, the Lions’ defense bowed up. Armed with a fresh set of downs inside the red zone, three plays netted a total of zero yardage for West Sabine left them with a fourth and long situation. An illegal procedure call against the Tigers pushed the ball back to the 16 and when Smith’s fourth down pass fell incomplete, the Lions took over deep in their own end of the field. Lovelady was unable to move the ball and was forced to punt. West Sabine returned the favor and punted the ball back to the Lions, as the first quarter expired with the Tigers ahead by a score of 6-0. The two teams continued to exchange punts until the second quarter was almost at its midpoint. After West Sabine took over at their own eight , thanks to a great punt from Jay Thomas Robinson, the turnover bug jumped up and bit the Tigers. On third and four from the 12, Smith dropped back to pass and was intercepted by Alex McKnight at the 34 yard line. McKnight was able to return the ball to the 27 and on the first play following the pick, Holsey found Hunter Murray on a swing pass. Murray shed one would be tackler, juked two more and outran the West Sabine defense to the end zone for the Lions’ first score of the night. The two point conversion was also successful as Murray found Petey Little in the end zone to put the Lions ahead 8-6 with 5:43 remaining in the half. Now with the lead, Lovelady wasted little time in extending it. On the ensuing kickoff, Devon Hammock kicked a little pop up that the Lions were able to recover at the West Sabine 42. After a sack of Holsey on first down and an incomplete pass on second, Holsey found Robinson for a 27 yard gain. Two plays later, Johnson broke through the line and sprinted into the end zone from 14 yards out. Hammock nailed the extra point to extend the Lions’ lead to 15-6 and close out the first half scoring. After the two teams came out of the locker room following the lengthy halftime Homecoming ceremony, the Lions struck again. On their second play from scrimmage in the third quarter, Holsey found Murray once again on a 67 yard TD pass. During the play, Murray appeared to sense he would be caught from behind and slowed down to let the defender over run him. Murray then accelerated and crossed the goal line as the scoreboard showed 11:05 left in the third. The Lions went for two and Holsey found Little in the back of the end zone to make the 23-6. The Lions added two more touchdowns in the fourth quarter on runs of two and 47 yards from Noah Johnson. Little hauled in both two point conversion attempts and after the Tigers scored two meaningless touchdowns late in the final period of play, the Lions sent their fans home happy with a 52-20 Homecoming win.